As binary options trading continues to gain prominence as an alternative investment and hedging vehicle, the number of binary options brokers entering the business, to take a slice of the market, has grown manifold. However, not all the binary options brokers will suit a trader’s risk profile. Thus, it becomes vital for a beginner to sign up with a proper binary options broker so that unwanted future conflict is avoided and trading can be commenced with peace of mind. 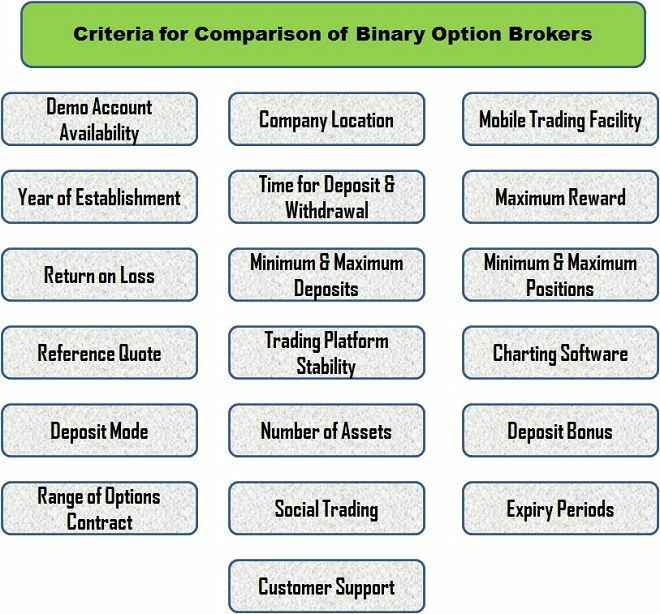 To achieve the objective, a trader should first of all compare all the binary options brokers based on the following criteria and arrive at the one matching his needs. A demo account enables a trader to get acquainted with a binary broker’s platform, improve the trading skills without risking real money and fine tune the strategy, if necessary. Thus, availability of a cost-free demo account provides a certain level of comfort to an aspiring binary option trader. Not all brokers provide a demo account. Additionally, the clauses for the availability of a demo account vary between brokers. Thus, it becomes vital for a trader to consider the availability and rules pertaining to a demo account while comparing binary option brokers. The jurisdiction under which a binary options broker operates speaks a lot about the company’s credibility. Generally, brokers registered under the European Union and USA is perceived to be trust worthy. Even though, the zone of registration has got nothing to do with the honesty of a binary option broker, still, a company located in a country with strict financial laws is seen as stable and dependable. At the least, traders will have recourse in case of any malpractices by a binary broker operating under stringent financial laws. Thus, head-quarters of a binary options broker should certainly be looked at while comparing different brokers. The adage “old is gold” perfectly fits a binary options business model. A binary options broker is considered to be financial stable if they had been operating without any major issues for a long period of time. The reason is that only a credible binary options broker who has a proper mechanism to balance the risk exposure will be able to survive in the business for several years. Thus, the year of establishment is certainly a factor to consider while comparing binary options brokers. Speed of deposits is a vital factor in binary options trading business. Not all traders would be interested in keeping a surplus balance in the trading account. As and when required, a trader should be able to deposit without undue delays. Similarly, payout delays beyond a week would put a serious question mark on the financial stability of the company. Thus, speedy process of deposits and withdrawals should be considered during the comparison of binary brokers. The maximum reward for a successful trade ultimately decides the breakeven percentage. Thus, a broker offering an attractive reward is always given preference by binary options traders. Early exit facility is yet another factor which should be considered along with the reward percentage. A broker offering a reasonable reward with early exit facility is better than a broker offering a high reward without any kind of early exit facility. As an act of encouragement, few binary brokers offer some sort of compensation for trades that result in a loss. However, the reward for successful trades will be relatively lower. If a trader starts with a small capital then such a kind of compensation will be helpful as the account will not get drained in case there is a series of losses. Thus, while comparing brokers, professionals’ advice a trader to take into account the rebate amount. The financial status of no two traders is similar. Thus, minimum deposit, which may look as a miniscule amount for one trader will look quite large for another trader. Since a trader should always invest only surplus funds, minimum deposit requirement is a must consider factor while comparing binary brokers. The maximum deposit amount is an aspect to be considered if a trader is in a position to invest large amount and plans to take multiple positions (trades) simultaneously. Most brokers do not demand taking more than one position at a time. However, brokers certainly stipulate the minimum value of a trade. If it is too much on the higher side then such a broker should be placed below those brokers who call for a small but reasonable amount to be invested per trade. As far as maximum position for a single asset is concerned the trading platform will certainly have an upper ceiling. If a trader plans to invest huge sum in multiple assets (& different kind of trades) then it is better to have a look at the fine print, which will clearly indicate the maximum volume of trade allowed at a given point of time. The minimum allowed position or minimum investment per trade is certainly a point to consider while comparing different binary brokers. The live price of an asset shown on the binary options trading platform may be derived from one or more sources. There are even instances of using custom mathematical calculations for arriving at the last traded price. The reference quote may be practically disadvantageous to a trader. Thus, it is always better to know the price source of a binary option trading platform. This is certainly a point to note while rating binary options brokers. It is not uncommon to see traders complaining about web based platform related issues including price freeze. Such problems may ultimately decide the fate of a trading account. Thus, it is important for a trader to compare the stability of trading platform provided by various binary option brokers. Since it is impossible for a trader to open account with all the brokers and test the platform, after considerable scrutiny, reviews left in the internet by reliable sources can be taken into account. Pertaining to certain terms and conditions, invariably all binary brokers offer some sort of bonus for the deposits made. It is up to the trader to take it or not. If the terms are hard to satisfy then the bonus will have practically little meaning. The terms of bonus is a matter to be considered while comparing binary options brokers. Depending on where a trader is located geographically, the choice of mode of deposit will vary widely. Thus, a trader should look into the different mode of deposits offered by a binary broker. While wire and credit/debit card transfers are commonly available mode of deposits there are brokers who offer a large range of electronic payment methods for depositing and withdrawing. While preparing a list of binary options brokers, a broker offering multiple modes of deposits is certainly placed higher than the one accepting only wire transfers. Most of the binary options strategies are based on technical analysis. Thus, it is quite important for a trader to have dependable charting software, which can show price movement without any aberration. If the price chart looks blur or does not contain basic analysis tools then the probability of making a perfect entry is lower. So, assessment of charting software is a must while comparing binary option brokers. Binary options brokers always make sure that a client does not leave them due to lack of assets for trading. However, there may be cases where a client may be interested in trading only a particular index or commodity, which may not be available for trading with a particular broker. Thus, a broker selection should also be based on the number of assets provided. A good binary option broker will be able to provide a wide range of assets for trading. This is a factor which needs to be noted while comparing binary option brokers. The expiry period of a binary options contract usually ranges from 30 sec to more than a week. While some brokers are flexible enough to allow customers to create their own contracts there are few others who offer only contracts with fixed expiry periods. Since a trading strategy may not be suited for a particular time frame, a client needs to look into this aspect before picking up a binary broker. Thus, comparison of binary options brokers should certainly involve looking at the range of expiry periods offered for trading. There are brokers who offer special range of options (for e.g., ladder options) which are distinct from the simple high/low bets. The rewards for such option contracts are usually higher. A speculator who is willing to take calculated risk for huge gains would certainly look for such kind of option contracts. Thus, the range of option contracts offered for trading is certainly a factor to be considered while comparing binary option brokers. New entrants to binary options trading will always look for some sort of guidance. Social trading fills up the space between a beginner and professional. Thus, it is a vital factor which should be certainly taken into consideration while comparing binary option brokers. A binary option broker is held with high regard if they provide a 24×7 customer support in more than one language. The nature (online chat, telephone call) and promptness of customer support also matters a lot. Such details should be considered while comparing binary option brokers. Binary options trading require lot of patience and concentration. Thus, traders would prefer to remain aloof during trading. However, there are situations where a trader may get held up for hours unexpectedly while traveling. In such cases, mobile trading facility will come handy. The trader will be able to take the opportunity to cash on a good trade setup. Usually, the above mentioned points are carefully analyzed while comparing binary options brokers. However, it should be noted that the needs and aspirations of each and every trader is unique. Thus, a broker who may look great for one trader will not be so for another. It should be remembered that comparisons are always made based on generic aspects related to trading. Read more articles on Brokers, Education.